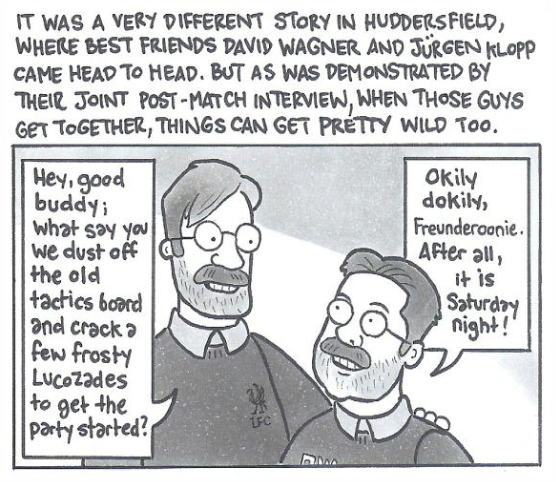 There exists a very simple equation that goes a little something like: Football + Cartoons = David Squires. 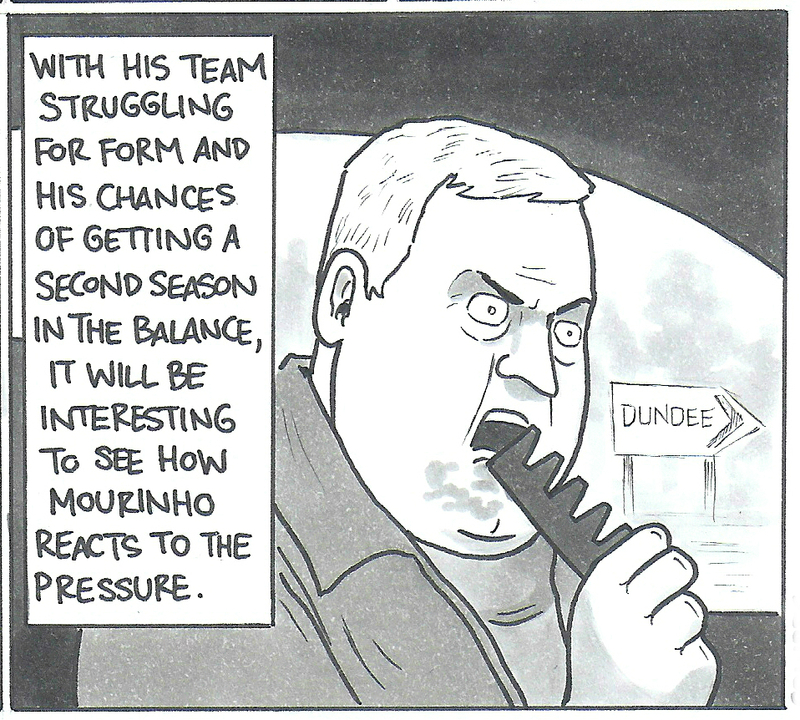 Or perhaps it’s David Squires + Football = Cartoons. Or … Squires x Cartoon? No, this isn’t a hipster merch collaboration. Forget it. The point is, today, David Squires is synonymous with football cartoons. His illustrations, within and beyond the confines of his comics, are so brilliant, his parodies so pertinent, his running jokes so routinely hilarious, there are few in the world who come to mind before Squires when the topic of conversation turns to football cartoons. A cartoonist for the Guardian, L’Equipe and 11FREUNDE, aside from his daily duties as the pen-wielding antidote to sporting monotony and salvation to all determined not to take a game quite so seriously all of the time, Squires is also fast becoming a seasoned author, about to add to his growing list of published books, regaling once more with his quirky takes on the history of the beautiful game in the upcoming Goalless Draws. These Football Times recently sat down with David to discuss the history of his love affair with both art and football, his menagerie of comedic influences, the ins and outs of his day-to-day, as well as his plans for channelling his creativity in the future, and much more. What are your earliest memories of football and how do feel this initial impression of the game impacted upon your decision to embark upon a career that allowed you to spend each day illustrating it? “It took me a while to develop an interest in football as a child, and I think I only did so because I realised that failure to do so would mean a lot of playtimes hanging out with the dinner ladies, nice as they were. The first time I joined in with a playground kickabout, I scuffed in a goal from about two centimetres out and celebrated like Marco Tardelli. I was pretty much hooked from that moment to this. 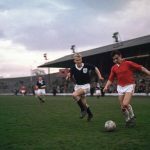 “The first match I attended was a school excursion to a Smiths Crisps Schoolboy International between England and Scotland at The County Ground, Swindon. I paid little interest in the match and spent the afternoon playing war on the open concrete terrace of the Stratton Bank. These days I usually just stare at my phone. 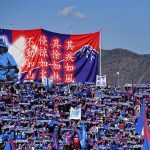 “However, once I’d fallen in love with football, I began an orchestrated campaign of whining to get my dad, himself a football sceptic, to take me to a proper match. Eventually he relented and my reward/punishment was a Canon League Division Four encounter between Swindon and Tranmere in March 1984. This was the worst season in Swindon’s history and they would end the campaign in 17th, their lowest ever league finish. “I remember little about the game, a 1-1 draw, other than the fact that my dad thought it was acceptable for us to clamber over some low fences in the North Stand and fill two seats right in the middle of the directors’ enclosure. This gave us a great view of the action for about 15 seconds until an official wandered over and politely turfed us out. In the not unlikely scenario in which somebody from your nascent years at school stumbles upon your work online or in print, do you think an old childhood friend or teacher would be surprised by what you do now, or was it always something of an inevitability? “Art was always my favourite subject at school, not least for the possibilities it presented for dossing about. If my fellow pupils thought about me at all, they’d probably think of me as the kid who liked drawing – I mean, that’s what I like to think; in reality they might have thought of me as the kid with a bad Jesper Olsen mullet who hung around with the dinner ladies too long! Do you remember your first ever comic strip or your first commission? What was it and, if you could redraw it today, what would you be compelled to change about it? “The first cartoon I had published was for the Swindon Town fanzine, The 69er, in 1992. The cartoon was on the subject of the striker Duncan Shearer, who had just been sold to the newly cashed-up Blackburn. The feeling amongst Swindon fans was that Rovers – a promotion rival – were simply corralling the division’s best players, with no intention of actually using them. This turned out to be true in the case of Shearer, who barely got a game. “I sometimes wondered if they signed the wrong Shearer, which would have made a better premise for a cartoon than the one I actually drew, which ended with a destitute Duncan Shearer vomiting in the street. Not exactly subtle, but hey, I was 17 and burning with a sense of injustice. What would you say have been the biggest influences on your style, both illustrative and comedic? What was it that so inspired you growing up and gently palmed (or dragged you kicking and screaming, be it as it may) in the direction of comic parody? “Most people assume that I was a fan of Roy of the Rovers when I was growing up, but that all passed me by. Because I came to football a bit later, I went straight from The Beano to Shoot and Match. The first football cartoon that really resonated with me was Billy the Fish in Viz. In fact, Viz was a huge influence, as it inspired me to draw cartoons of my fellow classmates, teachers and characters at school. “Given the number of times I’ve referenced it in my cartoons, you won’t be surprised to learn that The Simpsons and the work of Matt Groening have been a huge influence too. I’ve tried to ease up on the obscure Simpsons references, though, not least because I’ve exhausted all of them. What do you look for in a newsworthy event that makes you think it’ll be perfect for you to poke fun at? Similarly, what do you look for in a person that makes them ideal to caricature, and do you have a favourite from inside the world of football? “The best people to satirise are the pompous, the narcissistic, the arrogant, the corrupt, the bigoted, the bullies; those who abuse their power or make life generally more grim for us all. When drawing those characters, I’ll go for it, gloves off, which also makes drawing easier. Trump, Putin, Farage, Murdoch, Morgan, Rees-Mogg, Cameron; I’ll go in two-footed on those motherfuckers every single time. Not that it makes a lot of difference, but it’s beneficial for my mental health to get it out of my head and onto the page. “Of course, these are supposed to be football cartoons, but you can’t always shut out the noise of the world, especially when it’s got a dumb New York accent. There are certain people in the football world who have some of the characteristics listed above, but mercifully few who have them all. 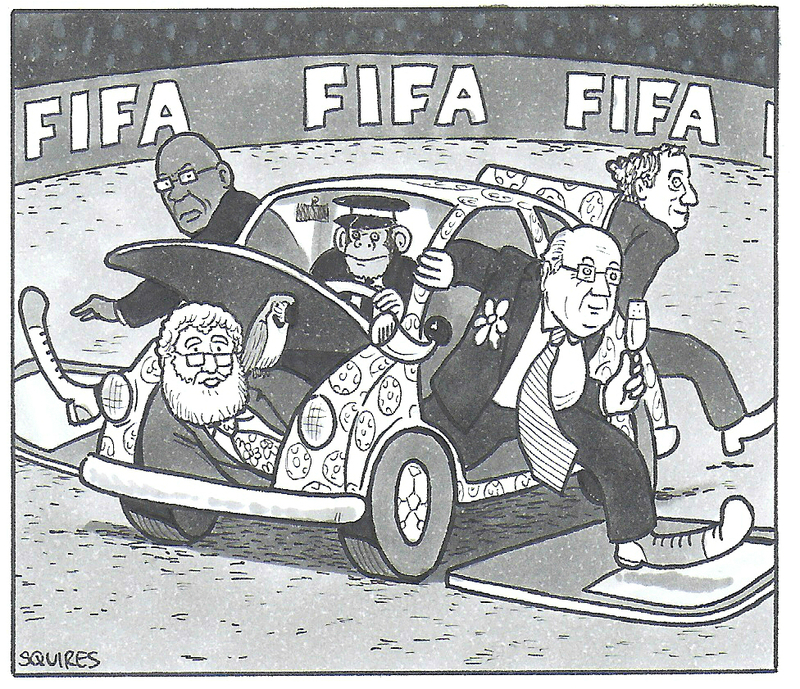 I must admit, I do miss drawing Sepp Blatter. “In terms of the events that make for good material, some of it comes down to timing. It’s easier to draw cartoons that resonate with readers during major tournaments, as more people are watching the same matches. I’m more comfortable when I’m writing cartoons about events off the pitch though. How do you deal with the pressures that must arise from being required to react so swiftly to the weekly news cycle? Are there any techniques you have in your daily practice that ensure you’re especially well equipped to leap up from your desk with another hilarious masterpiece to hand with plenty of time to spare? If there are any that you may be able to shed some light on, what are the surprisingly wonderful or surprisingly troubling aspects of your line of work? “The most positive aspect of my job is the feeling that I’m using my best skill. For many years, I worked in jobs where that wasn’t the case, and I’d feel constantly unmotivated and frustrated. Even in the years where I’d stopped drawing, I knew that it’s what I should be doing with my life. Maybe I’ll go back to working in the Australian Vocational Education and Training Industry one day (because what they’re crying out for is a distracted grump), but at least I’ll have known I’ve given this my best shot. “Occasionally, people get in touch to tell me that a cartoon I’ve drawn has had a special personal significance for them. That always means a lot to me. I’m grateful to the people who like and share the cartoons each week, and those who make the effort to tell me they enjoy what I’m doing, but where possible, I try to avoid online comments. I’m aware that I get off a lot lighter than a lot of people who work online, but my relentlessly self-critical inner monologue doesn’t need to be validated. “The troubling aspects of the job are probably common to those experienced by many freelancers. It is a solitary profession that requires you to spend a lot of time in your own head. That’s not always the best place to be. I experience significant periods of self-doubt, but have been doing this long enough to remind myself that the clouds eventually pass. What would you say is your one most treasured drawing and does it coincide with your proudest achievement to date? “There are drawings that I’ve been happy with and ones that have been popular with the readers, but I tend not to dwell on this kind of thing. You’re only as good as your last game and all that. I’m usually too preoccupied with thinking about the next cartoon and I still carry that dread that it could all come to an end as quickly as it took off. Imposter syndrome is real. Alongside your more typical daily musings, you’ve also dipped more than a toe into the literary world in producing two books: The Illustrated History of Football and its sublime successor Hall of Fame. Do you have ambitions to chase these literary detours with another book or perhaps branch out further and take your distinctive style into another medium? “I have another book (‘Goalless Draws’) out. It’s a collection of my favourite Guardian cartoons from the last four years, plus a few extra ones. I usually find it hard to look at any of my drawings that are more than a week old but it was a good process to review the last few years’ of cartoons and see how my work has developed over that time. It also reminded me of a few news stories I’d forgotten about, so hopefully readers will have that experience too. 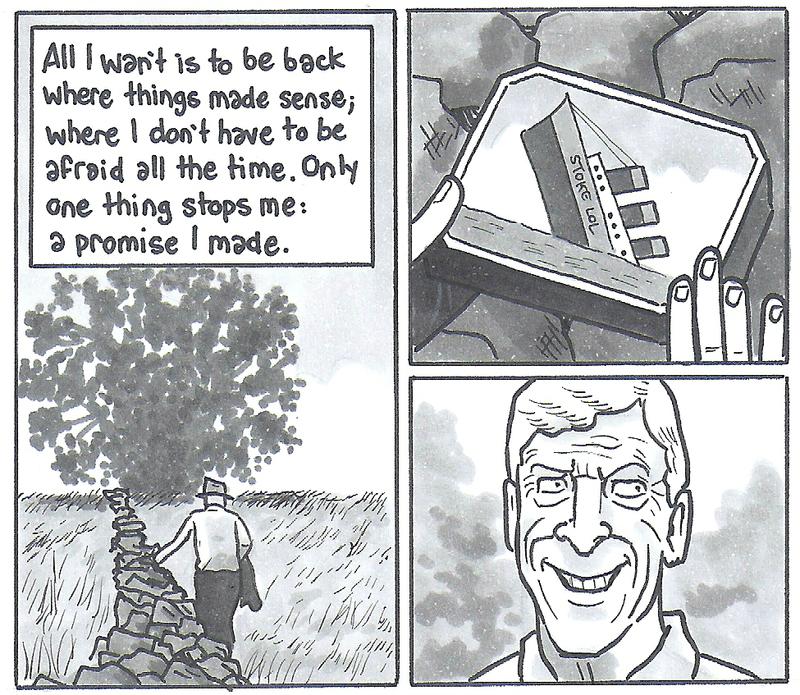 Thanks to David Squires for speaking to These Football Times as part of The Gallery. If you’re an artist for whom football remains the ultimate muse, and you’d like to feature in The Gallery, please email us with examples of your work.